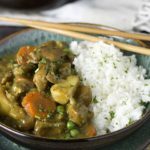 Impress your friends and family with this simple, fragrant and flavorful Japanese Chicken Curry. 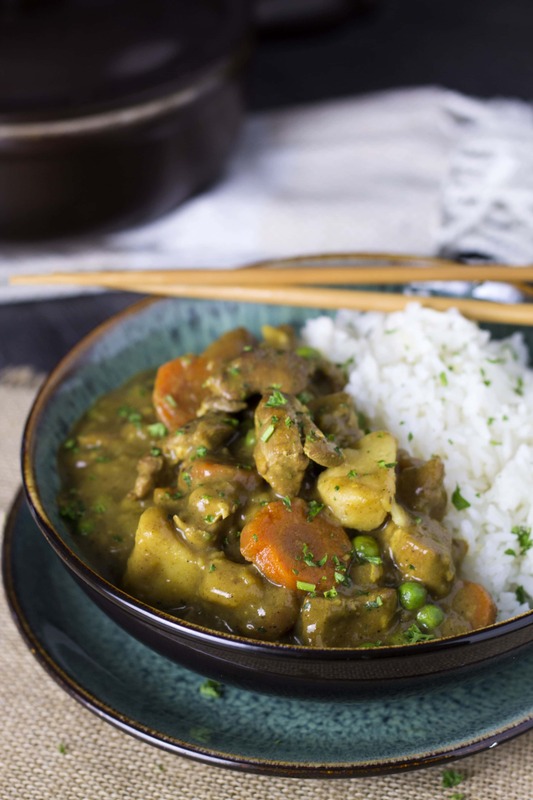 This easy recipe for Japanese Chicken Curry is a healthier take on fried Chicken Katsu Curry. Impress your friends and family with this simple, fragrant and flavorful dish. Our town just had a new Japanese restaurant open. We’re real foodies and make our way to any new restaurant that opens near by. I’ll be honest, besides sushi and hibachi grills, I’ve never really had Japanese food before, but after going to that restaurant, it’s a new favorite. They had a small lunch menu (we don’t have a babysitter so we schedule days off to have lunch dates while our son is at school). It was setup into meals. You pick one appetizer option (I had amazing pan fried dumplings), then you get a cup of Miso Soup (which was surprisingly delicious for a soup made from bean paste) and after that you choose a main meal. I had chicken teriyaki which was great, but my husband had a Chicken Katsu Curry. One taste and I dreamed about his lunch for days. So much that he had to take me back a week later so I could have my own. Of course, I had to figure out to make my own. I’m on a diet and they used thin sliced chicken breast that was coated in panko bread crumbs and deep fried. Although that’s good for a treat, it’s not something I make on a regular basis. I cut the cried chicken and used boneless, skinless chicken thighs instead. This dish is loaded with tender chunks of chicken, carrots and potatoes in a rich savory curry sauce. 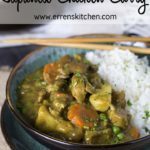 I’m telling you, if you are a fan on curry, you have to try this! Heat oil in medium saucepan, start by browning the chicken on all sides. Remove from the pan and set aside. In the same pan, add more oil if needed. Add the onion and garlic and cook until softened. Add the flour, curry powder and garam masala. Cook for 1 minute. Gradually stir in stock until combined; add the honey and soy sauce. Add the browned chicken, carrots, and potatoes. Slowly bring to the boil, turn down the heat and simmer for 25 minutes or until sauce thickens and the carrots are soft enough to eat. Add the peas and cook another minute. Hi, Monique, I’m glad you enjoyed, Thanks for the feedback! I’m my god, that is so sad, I hope the chicken wasn’t emotional haha! I will fix that right away thank you! 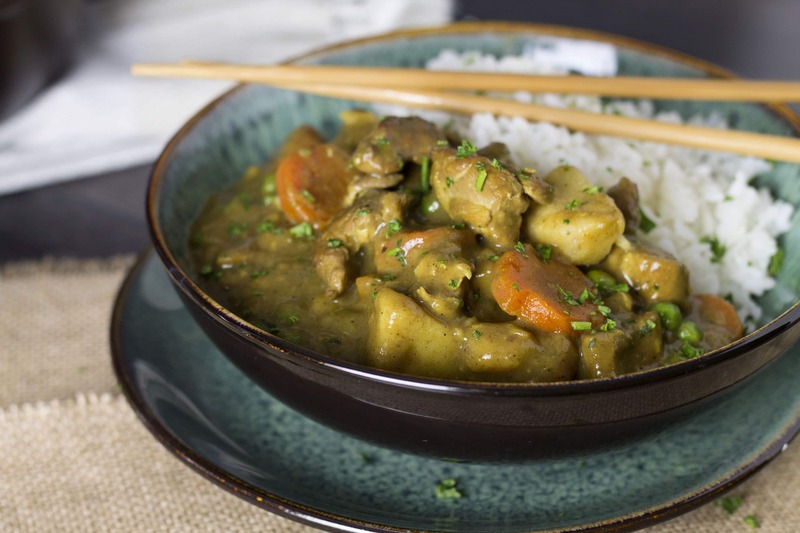 This looks like an awesome recipe for Japanese chicken curry. It looks like it is pretty easy to prepare too. I looooved this!!! Thank you for the great recipe. I purchased a packet of Japanese Curry powder from a small spice shop and I was looking for a recipe to follow. This was amazing and I will definitely be making this again. that’s so great to hear AnnaBelle! I’m so glad you liked it! I see nothing in this recipe that makes it Japanese, you don’t even use the japanese brand curry called ‘Golden Curry’. Made this recipe last night…it was delicious! Thank you so much for sharing! My family loved it! 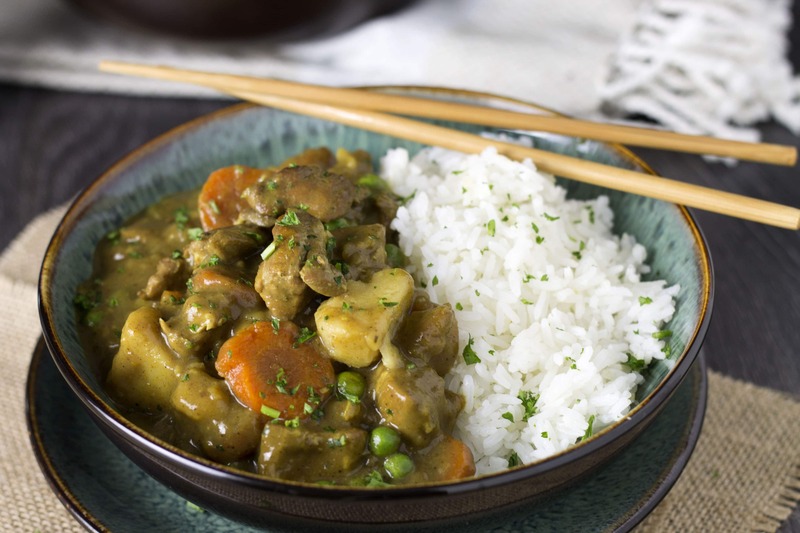 My mother, born & raised in Kyushu Japan, made her Japanese curry for us when I was a kid almost exactly this way. She didn’t use honey but I decided to add it as the recipe states and it was a perfect substitute for the sugar she normally used. I decided to use this recipe because now that my mom is older, it’s harder for her to remember measurements for recipes and I wanted to have the right balance of spices. Your recipe gave me a great place to start. I did add more curry and soy sauce, as my mother would, but otherwise it was spot on! BTW, this is the kind of non-stereotypical dish many Japanese families make at home. Oh…and although the Golden Curry mix might be convenient for some, my mother would NEVER use that for a homemade meal. Skip all the chemicals and do it from scratch, it’s worth it. Wow Patti, what great feedback! I’m so glad I was able to help you recreate a well loved, family recipe! Thanks so much for letting me know! I normally cook and eat Indian curries or sometimes Thai, so I’ve never tried a Japanese curry before. This sounds delicious and easy to make too!